Star Trek: The Next Generation (often abbreviated as TNG) is an American science fiction television series created by Gene Roddenberry twenty-one years after the original Star Trek series debuted in 1966. Roddenberry, Maurice Hurley, Rick Berman and Michael Piller served as executive producers at different times throughout the production. TNG premiered the week of September 28th, 1987, to 27 million viewers, with the two-hour pilot "Encounter at Farpoint". In total, 176 episodes were made, ending with the two-hour finale "All Good Things..." the week of May 23rd, 1994. The series (1987-94) was broadcast in first-run syndication with dates and times varying among individual television stations. Three additional Star Trek spin-offs followed The Next Generation: Star Trek: Deep Space Nine (1993-1999), Star Trek: Voyager (1995-2001), and Star Trek: Enterprise (2001-2005). The series formed the basis for the seventh through to the tenth of the Star Trek films, and is also the setting of numerous novels, comic books, and video games. 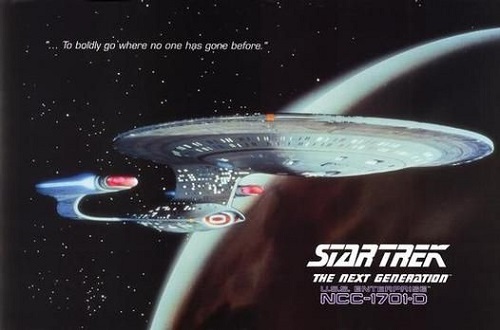 In its seventh season, Star Trek: The Next Generation became the first and only syndicated television series to be nominated for an Emmy Award for Best Dramatic Series. The series received a number of accolades including 18 Emmy Awards, two Hugo Awards, five Saturn Awards and a Peabody Award. The D'Kora-class Marauder was a type of advanced starship utilized by the Ferengi Alliance during the 24th century. This class of vessel was, at times, referred to by several classifications, including both a warship and transport ship by the Federation, and as an attack vessel by the Ferengi themselves. The USS Stargazer (NCC-2893) was a Constellation-class cruiser. The vessel was commanded by Jean-Luc Picard from 2333 to 2355. Stargazer was a participant in the Battle of Maxia Zeta in 2355. Daimon Bok returned the starship to the Federation in 2364. The B'rel-class (also known as the K22B-class) was a type of Klingon bird-of-prey scout starship in Imperial Defense Force service in the 23rd century. The Olympic-class hospital ship was a class of starship in service with Starfleet during the late 24th century. The Olympic-class served the Federation as early as the 2370s. In an alternate future, the Olympic-class was utilized primarily for medical emergencies. The USS Enterprise (NCC-1701-C) was a 24th century Federation Ambassador-class starship operated by Starfleet. This was the fourth Federation starship to bear the name Enterprise. In 2344, Captain Rachel Garrett was the commanding officer of this ship. The rogue band of Borg drones, led by Lore, used this unique design of ship. Unlike other Borg vessels, which are normally symmetrical, this one had an irregular, multi-leveled shape. The Romulan scout ship was a small starship used by the Romulan Star Empire for scouting missions during the late-24th century. They rarely ventured out as far as the Romulan Neutral Zone. The USS Kyushu (NCC-65491) was a 24th century Federation New Orleans-class starship operated by Starfleet. This frigate fought the Borg at the Battle of Wolf 359 in 2367, and was destroyed along with 38 other starships. Academy flight training craft were types of spacecraft flown by Starfleet Academy cadets. A type of sublight vessel was flown in the 2360s by such groups as Nova Squadron, who in 2368 attempted a, by then banned, five craft formation Kolvoord Starburst maneuver near Titan. The USS Ahwahnee (NCC-71620) was a 24th century Federation Cheyenne-class starship operated by Starfleet. The Ahwahnee, along with 38 other starships, fought the Borg at the Battle of Wolf 359 on stardate 44002. This unnamed combat vessel was encountered at the Qualor II depot in 2368. Of unknown origin, the vessel was involved in smuggling starship components from the depot by taking the place of the holding vessel USS Tripoli. The USS Phoenix (NCC-65420) was a 24th century Federation Nebula-class starship operated by Starfleet. This ship was constructed by the Yoyodyne Division at 40 Eridani A Starfleet Construction Yards and commissioned on stardate 40250.5 in 2363. In 2367, the Buran fought the Borg at the Battle of Wolf 359. It was destroyed, along with 38 other starships. The wreck was later among the vessels found at the Surplus Depot Z15 located in orbit of Qualor II. The Tellarite cruiser was a class of warship utilized by the Tellarites during the mid-22nd century. Sometime prior to the 2150s, future Tellarite ambassador Gral stood on the command deck of a Tellarite cruiser in Andorian space during a conflict where they were "driving those blue demons back into their territory." The Romulan science vessel was a type of science vessel in service during the mid-24th century, which was used to conduct standard and experimental research for the Romulan Star Empire, and notably by the Romulan Astrophysical Academy. In 2367, Princeton saw action and was lost along with 38 other starships at the Battle of Wolf 359. The wreck was later among the vessels found at the Surplus Depot Z15 located in orbit of Qualor II. The T'Pau (NSP-17938) was a Vulcan Mahl'kom group Apollo-class transport that was in service with the Vulcan National Merchant Fleet in the mid-24th century. T'Pau was named in honor of the Vulcan matriarch T'Pau. The Promellian battle cruiser was a starship of the Promellian military. The craft was built for many generations prior to the 14th century. The design of the Promellian battle cruiser's bridge was well structured and sophisticated. The ship itself was provided with power by Lang cycle fusion engines.